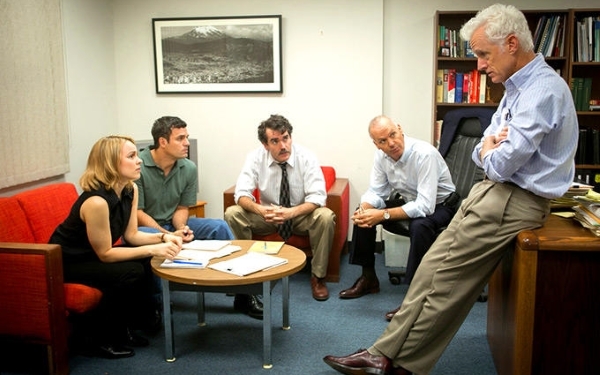 Playing out of competition at this year’s Venice Film Festival, Spotlight (2015) is a gripping drama able to stand alongside Alan J. Pakula’s All the President’s Men and a welcome return to form for director Tom McCarthy following the abhorrence that was The Cobbler (2014). Set in The Boston Globe newsrooms, it’s a meticulously built journalistic procedural and a timely reminder of the need for newspapers and journalists everywhere to go after those entrenched in power. When experienced reporter and editor Walter ‘Robby’ Robinson (Michael Keaton) is asked to sit down with newsroom chief editor Marty Baron (Liev Schreiber), he’s expecting to hear about more cuts and staff lay-offs. It turns out that Marty has a bit of a vision. He wants Robby and his investigative Spotlight team to follow-up on a story about the possible cover-up of a child abuse scandal involving the Catholic Church. Eager beaver reporter Michael Rezendes (Mark Ruffalo) is enthused and happily tracks down Mitchell Garabedian (Stanley Tucci), a lawyer who is a lone and eccentric voice in attempt to find justice for the victims or survivors (which is their preferred term) of sexual abuse perpetrated by priests. Sacha Pfeiffer (Rachel McAdams), in the meantime collects, victim testimony and becomes witness to the human cost. The story soon widens from a single case to the systemic concealment of abuse. The Boston Globe historically preferred not to hit out at the Catholic Church and risk alienating over half of their readership. As Robby and his team continue their investigation, that reluctance and hostility becomes evident inside and outside of the newsroom, on the golf course and in the bars, partly through incredulity and partly through a wish not to rock the boat. “The Church does so much for the city,” is the oft-heard refrain. Although the story is scandalous and horrifying, McCarthy approaches it with admirable restraint. There are no villainous clerics and even Cudrup’s slick, smiling lawyer is allowed to bite back with his own justification. Likewise, McCarthy trusts the journalists and the words that they can use, preferring not to revert to shocking flashbacks. We hear the testimonies and see the devastation caused to the lives and clear and present danger, especially when reporter Matt Carroll (Brian D’Arcy James) finds that one of the treatment centres the Church used to stow child-abusing priests is just around the block from his own house. With such a complex story and with the revelations already public knowledge, it’s testament to McCarthy and screenwriter Josh Singer’s skill that they build up tension slowly, unveiling the enormity of the story and giving us the same feeling of revelation as the reporters themselves. A key figure is deputy editor Ben Bradlee Jr. (John Slattery), whose initial disbelief to dawning anger mirrors our own reaction. With so much dialogue it’s also a huge credit to the ensemble cast that they can, in a few swift strokes, establish their characters – Tucci is a particular dab hand at this – and get on with the job. Spotlight permits Ruffalo a single cathartic rant, and it’s all the more effective for this. The enormity of the revelations and the impact it had only becomes apparent when the final credits roll. Conversely, the penitence of the Roman Catholic Church is more than apparent in the fact that Cardinal Law, the man who oversaw the Catholic Church in Boston during the period in question, was installed in the cushy post of the Basilica di Santa Maria Maggiore within the Vatican.